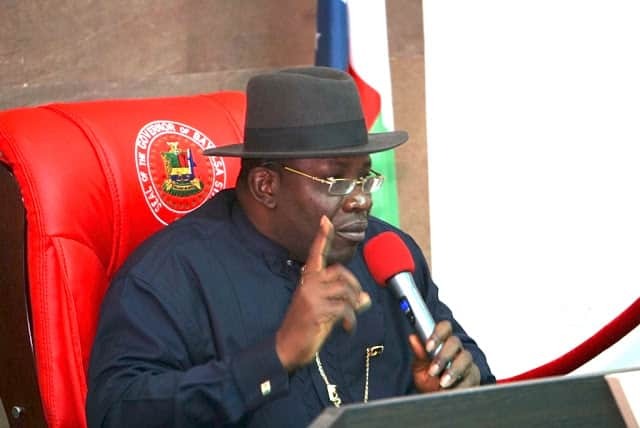 The Bayelsa government has said that it spent less than N60 billion on its airport project and not N120 billion being alleged by the minister of state for Agriculture and Rural Development, Senator Heineken Lokpobiri. Governor Seriake Dickson who made the clarification in Yenagoa on Thursday, February 14, said the amount spent on the project was minimal, compared to the figure mentioned by the minister. Legit.ng notes that Dickson said: “Let me clarify to the general public on the comments by the Minister of State for Agriculture and Rural Development, Heineken Lokpobiri, that we have spent over N120 billion on our airport project. “I must tell you, the project gulped less than N60 billion and not what the minister said during President Buhari’s visit to the state." The inaugural flight is expected to land at the airport at the time of filing this report as part of activities marking Governor Dickson’s seventh year in office. On achievements so far recorded by his administration, the governor said he was satisfied, especially about , health facilities, education and other related development for his people. He said: “We are happy with the completion of Nembe road, and the Sagbama-Ekeremor road which is ongoing as well as Oporoma road and lots of modern schools all over the state." Dickson, who also spoke on February 16 and March 2 general elections, urged the electorate to be mindful of the electoral code of conduct. The governor added: “Let me remind our people that every citizen has the duty and right to come out and be law-abiding and cast his or her vote because it is their civic obligation. Sylva who spoke at the police command headquarters in Yenagoa after meeting behind closed doors with the state commissioner of police, Aminu Saleh, said he was concerned about attacks on members of the APC in the state.